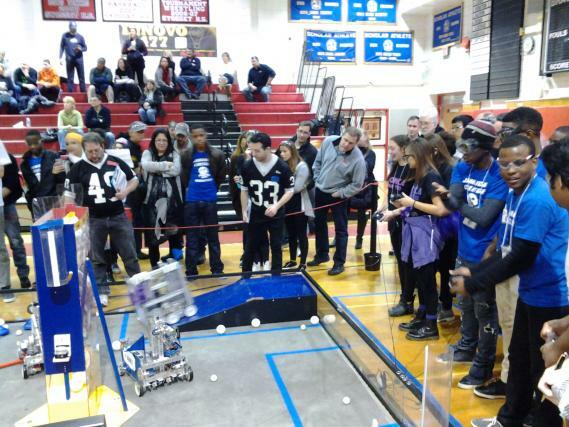 Members of the Jamaica College Secondary School Team (in blue) and the Hewlett High School Team attempt to move their robots with their controllers during one of the opening matches at the FIRST® (For Inspiration and Recognition of Science and Technology) Tech Challenge Qualifying Tournament at Syosset High School on January 31. New York City FIRST® (For Inspiration and Recognition of Science and Technology), along with School-Business Partnerships of Long Island, Inc. (SBPLI), presented the FIRST Tech Challenge Qualifying Tournaments on January 18 at Hewlett High School and January 31 at Syosset High School. Forty-nine teams from Long Island, the metropolitan New York area and the island country of Jamaica took part in the daylong competitions. The challenge was “CASCADE EFFECT,” in which Alliances of two teams programmed their robots to collect balls and place them in the rolling goals. The number of points for each ball scored in the goal is based on the length of the ball tube and the ball height. Following the tournaments, an award ceremony was presented by the FIRST judges. Different teams won trophies for various categories that represented a range of qualities, such as teamwork, creativity, and inspiration. Sponsors included School-Business Partnerships of Long Island, Inc., Hewlett-Woodmere Public Schools, Syosset Central School District, Rockwell Collins, and PTC.